Footwear by Footskins’ leather moccasins are American made, handcrafted from genuine Deerskin Leather & Cowhide Leather. Our handmade moccasin construction is patterned after Native American styled moccasin footwear and are most often handmade out of soft deerskin leather. Early settlers, traders and hunters soon discovered the comfort of Handmade Moccasins and in the 1950s and 1960s leather moccasins enjoyed a revival of sorts. Handmade leather moccasins are historical footwear yet still hold a lot of appeal even today. Moccasin Footwear by Footskins include a variety of handmade cowhide and deerskin Moccasin Boots, Moccasin Comfort Shoes, and Moccasin Slippers. We offer beautiful soft soled leather moccasins that are very lightweight and feature flexible uppers. For more rugged outdoor use, choose from our rubber soled moccasin styles including slip-on moccasins, Lace-Up Casual Shoes and ankle high Chukka Boots. Take a look at our selection of ankle high Chukka Boots and Custom Knee High Boots for men and women. 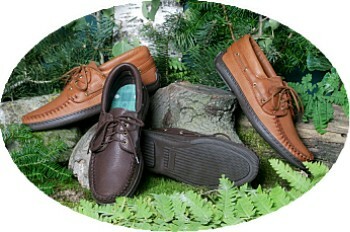 We also offer leather moccasins with SorboAir Insoles for arch support and extra shock absorption. 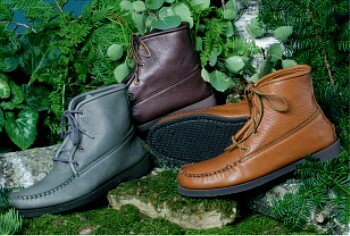 These are casual wear, men’s leather moccasin walking boots that come in canoe sole and crepe sole. They are handcrafted moccasin boots, handmade in true moccasin construction with much attention to detail. Men’s chukka boots are the most comfortable walking boots a guy could ever own and are available in cowhide or deerskin leather. Also known as Princess boots, these ankle high, chukka boots for women are lightweight, durable leather moccasins that are easy to maintain. Try the unsurpassed comfort of buttery soft, breathable deerskin leather moccasin boots for women, made in America using American leathers and featuring handmade wrap-around-your-foot moccasin construction. Our Princess, ankle high leather moccasin boots with flexible TPR rubber soles are durable chukka boots for outdoor wear. The great thing about soft, breathable deerskin leather moccasin boots is that there is no need to “break them in”. For extra durability, we also offer cowhide knee high moccasin boots. Leather moccasin knee high boots are comfortable from the moment you put them on and available for both men and women. Knee High Moccasin Boots feature handmade construction using only American leathers and are handcrafted with gusseted tongues, four layers of leather in the soles (for durability) and full lacing fronts. They can also be handcrafted for big calves, thin legs and for wide fit. Footskins offers an excellent selection of made in America slip-on style leather moccasins for men plus men’s comfort shoes including padded collar lace-ups. Choose from our many styles including crepe sole leather moccasins, canoe sole moccasins or men’s comfort shoes with rubber soles, softsoles or molded soles.These are handmade men’s moccasins using the finest American leathers for the best in comfort and fit. Many of our handcrafted men’s moccasins and men’s comfort shoes are now available in either deerskin or cowhide. Our women’s leather moccasins come in many great styles including canoe sole, flower toe, lace-up, molded sole, and teepee boots to name a few. All ladies leather moccasins and moccasin comfort shoes that we carry here at Footskins are made in America using only the finest American leathers to ensure quality. Choose ladies leather moccasins and women’s comfort shoes in soft, breathable deerskin or the more durable cowhide. We also carry teepee moccasin boots; the best thing next to bare feet! Footskins combines breathable deerskin leather construction with genuine soft sheepskin lining for unsurpassed moccasin comfort in men’s slippers. Handmade and made in America, these men's moccasin slippers are lightweight and offer superior warmth and comfort. We offer both slip-on moccasin slippers and 2 eyelet lace-up style men’s slippers. From softsole slippers to molded sole moccasins and 2-eyelet sheepskin women’s slippers, our ladies moccasin slippers are made in America and feature genuine moccasin construction. These are handmade luxurious moccasins slippers, hand crafted with genuine, durable deerskin and lined with the softness of sheepskin. Check out our selection of handmade, deerskin Children’s Leather Moccasins. For more information about handmade leather moccasins for men, women and children including moccasin boots, comfort shoes and moccasin slippers, please check out our FAQ page or click on our categories on the left for more information. To order cowhide and genuine deerskin leather moccasins please Contact Your Handmade Leather Moccasins Representative or call us at 507-498-3707 weekdays, 8:00 – 5:00, CST. “Just a quick note to say Thanks! These are really lovely and so soft and comfortable. Thanks also for all your help in getting the right fit for my feet. View our comfortable deerskin boots!